First let me start out by saying that becoming a freight broker or freight agent is not some pie in the sky instant path to riches! Yes there are a lot of opportunities and good freight brokers and agents are in high demand but it is not some get rich quick scheme, I see it as more of a get rich slow opportunity! Like any business, success or failure is going to be in direct correlation to the skills, planning, resources and hard work of the people running it. Download Your FREE REPORT Now – 4 Reasons Why Top Freight Brokers Earn More! 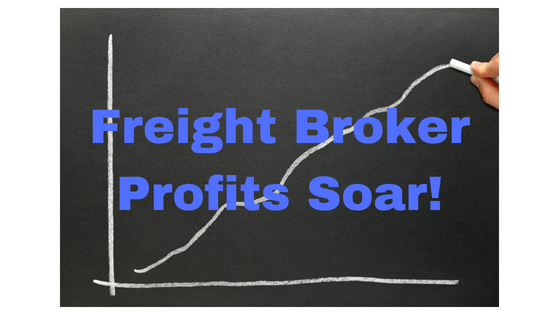 To get started I thought I might share how much the top 5 freight brokers did in revenue for 2015 based upon Transport Topics Top 50 Freight Brokerages rankings. First please let me state for the record that these are the top freight brokers in the U.S. and are not the norm or average. The fact is, the freight brokerage business is very fragmented with thousands of brokers; the majority of which do less than $5 million per year in sales. As you will learn very quickly in business, revenue is great but profit is the key. I estimated that most freight brokers operate in the realm of 12-20% gross margins. That means on $5 million in revenue the gross margin contribution would fall between $600,000 and $1 million. To determine actual pre-tax profit you then need to subtract all your expenses including office expenses, utilities, marketing, salaries, commissions, travel, entertainment, etc at which point your pre-tax profit on $5 million would like fall somewhere between 5 -10% of revenue which would equal $250,000 to $500,000 in before tax profit. As for freight broker agents, of which I have met hundreds of during my career, the earnings once again are based heavily on their skills, planning, resources and work ethic. Small freight agents that are new to the industry conservatively earn $30,000 to $50,000 per year in commissions working from home while more experienced freight agents that I know earn $100,000 to $400,000 or more per year. As you saw in the video above, top freight broker agents can earn as much as $50,000+ per month in commissions depending upon the size of their customer base and the amount of freight they move daily. Bottom line, becoming a freight broker or freight agent can be very lucrative but like I said at the beginning, this is not a get rich scheme but with the proper training, a good plan and hard work there is a wealth of opportunity available. For more details on why now is the best time to become a freight broker or freight agent check out my previous at titled, Timing is everything, why become a freight broker today? If you enjoyed this post or have questions reply below with your comments I always enjoy your feedback! 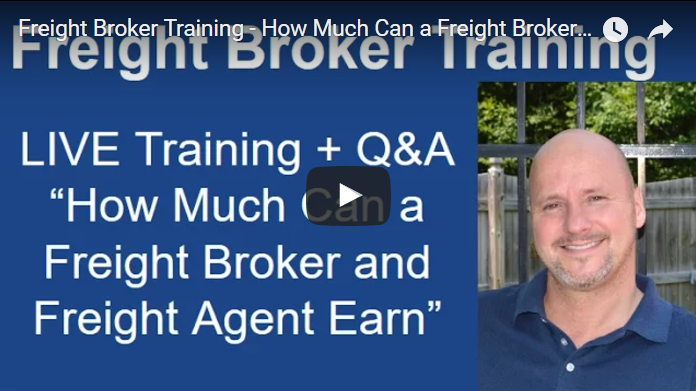 3 Comments on "How much can a freight broker or freight agent earn?" Leaving retail to a better position plus having a better sense of being able to breath.. I am interested in becoming a freight agent. If freight brokers apply their mind to the fullest, certainly they are the true king when it comes to earning in the sphere of Freight forwarding.